Last week was a roller coaster for me. I worked the hole week gathering everything I need for the Mercadito of Agora Mall here in Santo Domingo. Most of you might not know what a ‘mercadito’ is. Basically, is a day during which Agora Mall offers the change for entrepreneurs to be part of a mini farmers market. They offer it to promote local talent. That being said, I needed to get everything I together for that Saturday. I usually have a special cupcake favor every week. Since my nan had been making marmalade all month. 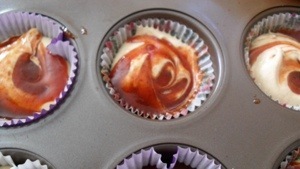 I decided it would be great to use it in on my cupcakes in some way. 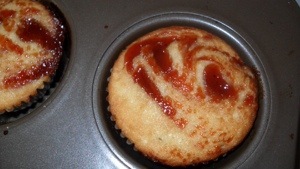 She had a fresh bash of guava marmalade made and what goes best with that flavor…. cheese. I know it sounds weird but it works. – 1 1/2 cup of Guava Marmalade. Make sure its fluid enough to a spreadable consistency. 1. 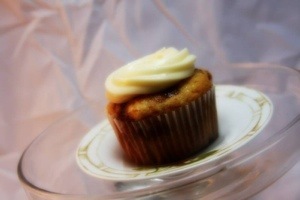 Follow the cupcake recipe and fill in each cupcake liner with batter. 2. Warm your marmalade a little to make it more fluid. 3. Distribute about 1 tb of marmalade per cupcake. 4. With a tooth pick or the back of a spoon. Mix the marmalade with the vanilla batter until you get a beautiful marvel effect. 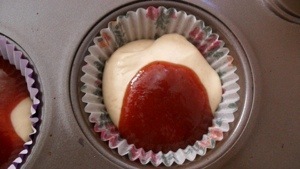 * try to insert the toothpick and lift the batter from the bottom to the top. 5. 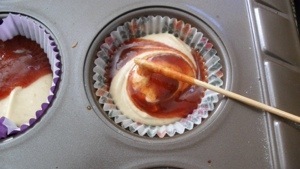 Bake the cupcakes at 350° for 15 to 20 minutes. Bear in mind you might have to adjust the temperature of your oven according to your environment … And his mood. * dont get scared if your cupcakes don’t rise as much. This batter is a bit more humid due to the marmalade. – 3 cups of sifted powdered sugar. 1. In a stand up mixer, cream together the butter and cream cheese until we’ll incorporated. 2. Add I the vanilla extract. 3. Mix I the powdered sugar and beat until fluffy. I hope you enjoyed reading this and try it at home. Thank you so much. I’ll most definitely have a look at your blog. Thanks. I hope you give them a try and love them as much as I do.